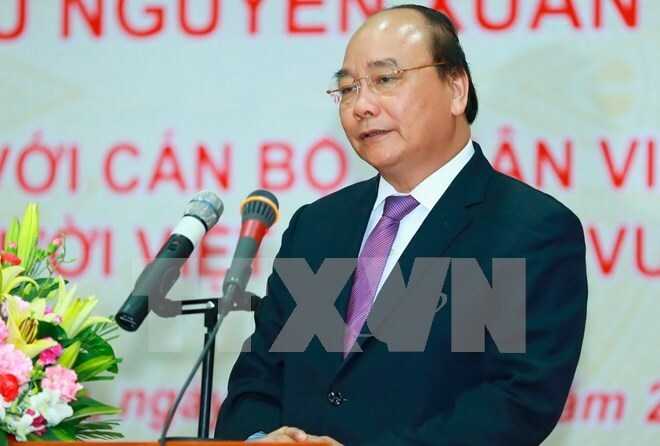 Phnom Penh (VNA) – Prime Minister Nguyen Xuan Phuc wishes that the Senate and National Assembly of Cambodia would continue paying attention to increasing the economic, trade and investment ties with Vietnam while meeting the leaders of the two bodies in Phnom Penh on April 25. At his meetings with President of the Senate Samdech Say Chum and President of the National Assembly Samdech Heng Samrin, PM Phuc delivered his hope that the two legislative bodies will coordinate to push for the early completion of land border demarcation and border marker plantation with Vietnam and make it easier legally for Vietnamese expatriates in Cambodia to lead a stable life and business. The Cambodian legislative leaders asserted that Cambodian people have never forgotten the heroic sacrifice made by the Vietnamese volunteer soldiers to help them escape the Khmer Rouge’s genocide and rebuild their country. The two sides agreed to work closely in activities to celebrate the 50th anniversary of diplomatic ties (June 24), saying the effort will help people of all strata, especially young people, gain a right understanding of the countries’ traditional friendship and solidarity and take responsibility for preserving it. On the day, PM Phuc paid a New Year visit to the Great Supreme Patriarch Buddhist Monk King Tep Vong, who thanked the PM and Vietnamese people for incessantly assisting Cambodian people to build important facilities, including the freshly-inaugurated Long Binh-Chrey Thom bridge. He received President of the Cambodia-Vietnam Friendship Association Men Sam An, who is also Deputy Prime Minister and Minister of National Assembly-Senate Relations and Inspection. He said the Association has made positive contributions to the two countries’ relations, and has, together with the Vietnam-Cambodia Friendship Association, played an important role in connecting the two people in all areas. The Vietnamese Government highly valued the contributions of the Association and its President to the bilateral traditional friendship and multi-faceted cooperation, he said. Men Sam An said she is delighted with the results of PM Phuc’s talks and meetings during the visit, and expressed her hope to receive the governments’ due attention so her association can accomplish the task of bridging Cambodian and Vietnamese people.